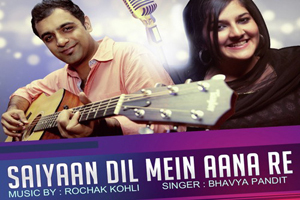 A very popular song from 1951 film “Bahar” is recreated and sung by Bhavya Pandit. The video of this song is available on YouTube at the official channel Saregama GenY. This video is of 4 minutes 02 seconds duration. Lyrics of "Saiyaan Dil Mein Aana Re"
Lyrics in Hindi (Unicode) of "सइयां दिल में आना रे"
The last album became indicative thanks to the original compositions. The touching text and melody have become a suitable basis for this.